A Hebrew Hour is defined as 1/12 of the time between sunset and sunrise, or 1/12 of the time between sunrise and sunset. The only Scriptural reference to there being 12 Hebrew Hours in a Hebrew Day is found in John 11:9 where Yeshua ( יהושע ), Jesus the Messiah asked the question, "Are there not 12 hours in a day?" The Torah, the Prophets and the Writings do not number specific Hebrew Hours. Only the Messianic Scriptures number specific Hebrew Hours in Matthew, Mark, Luke and Acts. In the Creation Calendar, Hebrew Hours begin at sunrise and sunset. A Hebrew Hour occurring between sunset and sunrise is called a Hebrew Night Hour. A Hebrew Hour occurring between sunrise and sunset is called a Hebrew Day Hour. In the Age of Torah the time between sunset and sunrise was divided into three watches. The evening watch is alluded to by Moses in Psalms 90:4. Psalms 90:4 For a thousand years in Your sight are as one day when it is past, as a watch in the night [the evening watch]. · This verse alludes to the fact that one Hebrew Day is past at the moment of sunset when the evening watch begins. It also alludes to the fact that one millennium ends and another millennium begins at sunset when the evening watch begins. · The middle watch of the night is mentioned once in Judges 7:19. · The morning watch is referred to by Moses in Exodus 14:24 and is also mentioned in 1 Samuel 11:11. Since the time of the Age of the Messiah (coming of Yeshua), the time between sunset and sunrise was divided into four watches. 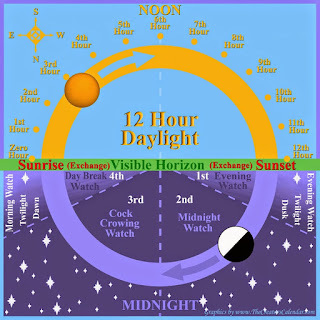 · Sunset occurs and the First Watch begins exactly at the beginning of the first Hebrew Night Hour. · The Second Watch begins exactly at the beginning of the fourth Hebrew Night Hour. · Midnight occurs and the Third Watch begins exactly at the beginning of the seventh Hebrew Night Hour. 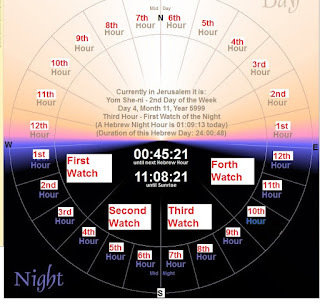 · The Fourth Watch begins exactly at the beginning of the tenth Hebrew Night Hour, and ends at sunrise at the end of the twelfth Hebrew Night Hour. Sunrise is always exactly at the beginning of the first Hebrew Day Hour. Mid-day occurs exactly at the end of the sixth Hebrew Day Hour. Sunset occurs exactly at the end of the twelfth Hebrew Day Hour. · The second watch and third watch are each mentioned once in Luke 12:38. · The fourth watch is mentioned once in Matthew 14:25 and once in Mark 6:48 as the time when the Messiah walked on the water. **These verses are the reasons behind to the common name of the fourth watch – ‘the watch of miracles’. To this day in Israel, when prayer teams need fast action in answer to prayer, they meet at 4am! This is also the time that God has come to Mark since His prodigal return - with answers to prayer, prophecy and even his baptism in the Holy Spirit. Praise God! 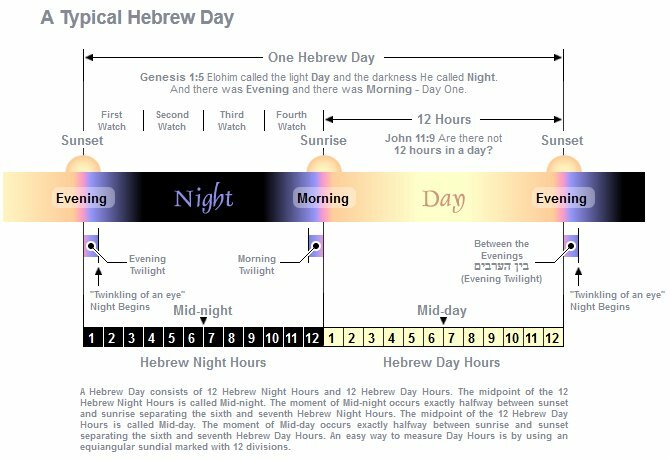 There are always 12 Hebrew Night Hours and 12 Hebrew Day Hours in a Hebrew Day. This diagram represents a typical Hebrew Day in which the duration of both the nighttime and the daytime hours are about the same. This occurs twice a year around the time of the fall equinox and spring equinox. It is important to note that the duration of a Hebrew Hour varies with the season. A Hebrew Day Hour is shorter in duration during winter, when a Hebrew Night Hour is longer in duration. A Hebrew Day Hour is longer in duration during summer when a Hebrew Night Hour is shorter in duration. In this diagram, a Hebrew Day Hour is longer in duration than a Hebrew Night Hour. This occurs in summer. The daytime hours are the longest on the day of the summer solstice. In contrast to Matthew, Mark, Luke and Acts, the book of John, as it now exists in the Greek manuscripts, numbers hours from midnight as the Romans did. · Pilate questioned Yeshua the Messiah at the sixth hour Roman reckoning according to John 19:14 which is the twelfth Hebrew Night Hour or 6am. · Yeshua the Messiah sat at Jacob's well at Sychar at the sixth hour Roman reckoning after a tiresome journey according to John 4:6 which is the twelfth Hebrew Day Hour or 6pm. · A nobleman travelled the better part of a day from Cana to Capernaum and met Yeshua the Messiah at the seventh hour Roman reckoning according to in John 4:52 which is the first Hebrew Night Hour or 7pm. · The disciples came to the place Yeshua the Messiah was staying at the tenth hour Roman reckoning and stayed with Him for the rest of that day according to John 1:39. The tenth hour Roman reckoning is the fourth Hebrew Day Hour or 10am. Although some have claimed there is no historical proof that the Romans counted the hours from midnight, such proof indeed exists. According to Gaius Plinius Secundus who lived between 23 C.E. and 79 C.E., the Roman authorities counted civil hours from midnight. Pliny the Elder, Natural History 2:77: "The very day itself men have observed in various manners. The Babylonians count the period between the two sunrises, the Athenians that between two sunsets, the Umbrians from midday to midday, the common people everywhere from dawn to dark, the Roman priests and the authorities who fix the civil day, and also the Egyptians and Hipparchus, the period from midnight to midnight." Today, the Gregorian Calendar counts civil hours from midnight similar to the way the Romans did. There are always exactly 24 Hebrew Hours between two sunsets. However, the duration of time between two sunsets measured in civil hours, minutes and seconds changes slightly throughout the year. The curve on the graph below represents the time difference in seconds between 24 civil hours and 24 Hebrew Hours throughout the year at Jerusalem. The blue area represents the period when 24 Hebrew Hours are slightly longer in duration than 24 civil hours. The purple area represents the period when 24 Hebrew Hours are slightly shorter in duration than 24 civil hours. The duration of 24 Hebrew Hours on the Hebrew Day of the spring equinox is 24:00:41 or 41 seconds longer than 24 civil hours. The duration of 24 Hebrew Hours on the Hebrew Day of the fall equinox is 23:58:41 or 79 seconds less than 24 civil hours. 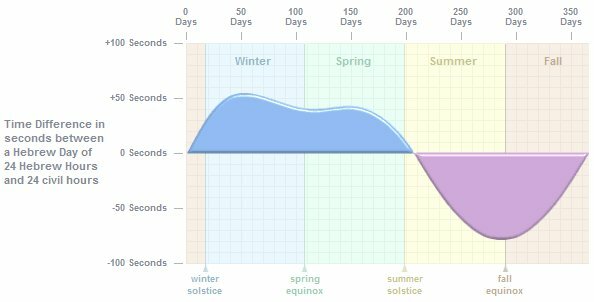 Notice there is little correlation between the shape of the time variation curve and the seasonal solstices and equinoxes. A Hebrew Day always has exactly 24 Hebrew Hours. A civil day consists of 24 civil hours. However, a Hebrew Day does not always equal 24 civil hours. Since a Hebrew Day is the time from one sunset to the next, its duration will differ from 24 civil hours due to the civil time difference between the two sunset times. The curve on this graph represents the time difference in seconds between a Hebrew Day of 24 Hebrew Hours and a civil day of 24 civil hours throughout the year at Jerusalem. "A change of temperature from winter to summer can shift the times of sunrise and sunset by about 20 seconds in mid-northern and mid-southern latitudes. Similarly, observing sunrise or sunset over a range of barometric pressures leads to a variation of a dozen seconds in time." Jean Meeus, Astronomical Algorithms, Second Edition, p.101. "Near the horizon unpredictable disturbances of the atmosphere become rather important. According to investigations by Schaefer and Liller, the refraction at the horizon fluctuates by 0.3° around a mean value [34 minutes of arc] normally, and in some cases apparently much more ... it should be mentioned here that giving rising or setting times of a celestial body more accurately than to the nearest minute makes no sense." Jean Meeus, Astronomical Algorithms, Second Edition, p.107. For these reasons, actual observed sunrise and sunset times at Jerusalem may differ by as much as one minute due to daily variations in temperature and barometric pressure. In winter when the temperature is colder, the actual sunrise may occur earlier than projected times. Also, on a day when the barometric pressure is higher, sunrise may occur earlier. Cold temperature and high barometric pressure combined work cumulatively in causing the sunrise to occur earlier than the projected times. Torahcalendar.com only displays sunrise and sunset times to the nearest second to better illustrate the passage of time while providing a near real-time simulation of these events. A Hebrew Day begins and ends at the moment of sunset on the Creation Calendar. The time of sunset is defined as the moment the trailing edge of the sun's disc disappears below the horizon to the west, as seen by an observer at a particular location on earth. At sunset, the true position of the sun is about one sun diameter below the horizon, yet delayed visibility occurs due to the bending of light through the atmosphere as a result of refraction. Sunset should not be confused with night. The time between sunset and night is called evening twilight. The time between night and sunrise is called morning twilight. A Hebrew Day begins at sunset and transitions from evening twilight to night to morning twilight to day to sunset. The first half of a Hebrew Day lasts from the moment of sunset to the moment of sunrise. The Scriptures divide the time between sunset and sunrise into four watches, each containing three Hebrew Night Hours. The second half of a Hebrew Day lasts from the moment of sunrise to the moment of sunset. Sunrise is defined as the instant at which the upper edge of the sun's disc appears above the horizon in the east, as seen by an observer at a particular location on earth. As atmospheric refraction causes the sun to be seen while it is still below the horizon, both sunrise and sunset are in a sense optical illusions. The second half of a Hebrew Day lasts from the moment of sunrise to the moment of sunset. The period between sunset and night is defined by the Hebrew phrase בין הערבים – “between the evenings.” This is the time of evening twilight. This phrase has been mistranslated in the Tanach as “afternoon”. It appears in the Torah as the time when the Israelites would eat quail (Exodus 16:12), as the time when the Menorah was to be lit (Exodus 30:8), as the time when the evening sacrifice was to be offered (Exodus 29:40-41), and as the time when the Passover was to be slain (Exodus 12:6). It is the whole counsel of Scripture on the Passover which proves that the Hebrew between the evenings - refers to the time of evening twilight. All of the ceremonies of the Passover occur on Day 14 of Month 1 (Numbers 9:3). In the Passover of the Exodus, a lamb was slain after sunset, the death angel passed over at midnight, and the leftovers were burnt before morning on Day 14 of Month 1 (Exodus 12:3-29). The Scriptures clearly distinguish between the Passover on Day 14 of Month 1 and the seven days of Unleavened Bread which begin on Day 15 of Month 1 (Leviticus 23:5-6). These facts have caused scholars to conclude that the Hebrew phrase between the evenings - refers to the period between sunset and night or evening twilight. In Hebraic thought, evening twilight is understood as a transitional period between day and night. It is currently understood that it is evening twilight as long as two stars of medium magnitude are visible, but it is night upon the appearance of a third star of medium magnitude. In ancient times, some understood that night begins in a moment in time which is impossible to determine called the twinkling of an eye. This is interesting, as Paul prophesied that the righteous would be resurrected in the twinkling of an eye. 1 Corinthians 15:51-52: Behold, I tell you a secret; We will not all sleep, but we will all be changed. In a moment, in the twinkling of an eye, at the last trumpet, for it shall sound, and the dead shall be raised incorruptible, and we shall be changed. Paul's use of the phrase the twinkling of an eye aligns perfectly with the ancient understanding. The exact moment night begins therefore remains a little mysterious in Hebraic thought. In contrast, the modern world subdivides evening twilight into three definitive subcategories. Evening civil twilight begins at sunset and ends when the center of the sun is 6° below the horizon. Nautical twilight is when the center of the sun is between 6° and 12° below the horizon where navigation via the horizon at sea is not possible. Astronomical twilight is when the center of the sun is between 12° and 18° below the horizon where the sky is dark enough for astronomical observations. Morning civil twilight begins when the center of the sun is 6° below the horizon and ends at sunrise.